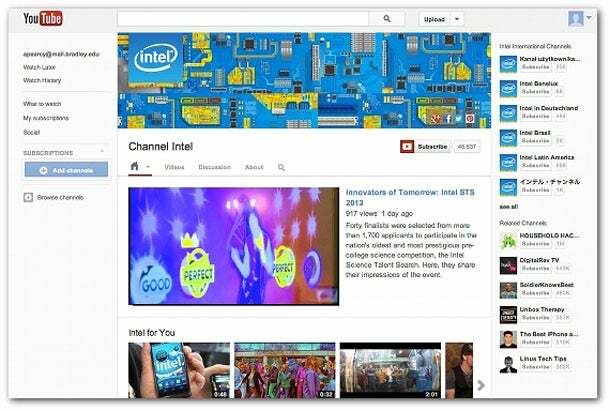 YouTube has released its new channel layout, YouTube One Channel. The updates give brands the opportunity to personalize and organize their page in ways that are very different from previous user capabilities. The new YouTube One Channel enables businesses to upload a welcome video geared toward viewers who don’t subscribe to the page. When making the welcome video, keep in mind that viewers don’t enjoy advertisements and tend to engage more with videos that have a personal element. Also, try to keep the videos short, between roughly 30 seconds and a minute, although if your content is compelling enough, you can certainly exceed that limit. Here are some welcome video ideas in action from several large brands. The new YouTube One Channel is easier to personalize in some ways and more difficult to personalize in others. For instance, personalized backgrounds have been removed but there is now the option to add a large header image called “Channel Art.” This is a way for companies to present a well-branded page that is clean and does not detract from the videos. The Channel Art will also serve as a background for the brand’s logo and social media buttons. This is great for brands looking to drive traffic from their YouTube page to their other social media environments because the buttons are displayed in a format that viewers are guaranteed to notice. YouTube also enables users to re-organize their content. Businesses can optimize this feature by categorizing their videos and organizing them into playlists. By organizing videos into playlists businesses are making it easy for viewers to find a collection of videos on a topic of their interest and helping to increase the amount of time users spend on the business’ YouTube channel. Companies without the resources to develop multiple new videos will also be able to use this new feature to highlight their older videos. This is a great way to keep a YouTube page looking fresh and updated even if there is a long period between video uploads.